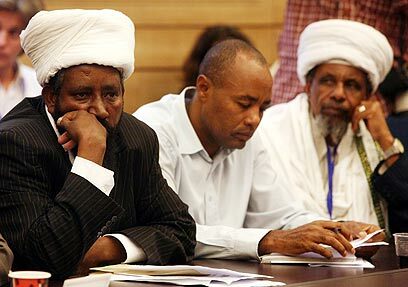 Many member of Knesset rallied together Monday around the issue of immigration from Ethiopia's Falashmura tribe during a joint discussion of the Immigration and Absorption Committee and the State Control Committee. The coalition and the opposition, Right and Left, immigrants and native born – they all attacked the Interior Ministry for not yet completing their investigation of the eligibility of the 8,700 some odd Falashmuras still waiting in the transit camp in Gondar, Sudan to immigrate to Israel. The State Comptroller ordered that they wait there for further authorizations about a year and a half ago. Knesset Speaker Reuven Rivlin spoke out prominently against the delay and focused his criticism on Prime MinisterBenjamin Netanyahu: "Israeli governments come and discuss and ultimately evade carrying out the task they have been charged with. There are people today in transit camps who do not know their fate. It cannot be that a prime minister, who once was the opposition chairman, made statements against the then prime minister, but when he himself becomes prime minister, he says something else." Since the beginning of the year, the immigration of the Falashmura resumed about a year and a half after the government's decision to do so following a long recess. Jewish Agency Chairman Natan Sharansky announced in Monday's discussion that about 75 immigrants will land in Israel Tuesday night, joining another 675 who arrived in Israel in 2010. Interior Minister Eli Yishai promised to make an effort to bring every Ethiopian Jew to Israel within a year. "I have been following the story of Ethiopia's Jews for many years," said Yishai. "I hope and believe that this will not be a budget issue. There was opposition from the Finance Ministry and the Prime Minister's Office – and we changed this. This is an issue of saving people's lives. I instructed them to promote and expedite the immigration so that we will finish with the story within a year. Interior Ministry and Jewish Agency representatives are checking the list." According to Yishai, he instructed Interior Ministry employees dealing with the issue "to treat whoever is waiting in Gondar as if your family were there." However, many of the MKs had many gripes against the Interior Ministry. "We haven't been able to receive this list for more than a year," claimed MK Uri Ariel (National Union). "The government has no intention of handing over the list; they just 'get us involved.' There are lives at risk there; the world needs to take care of them. The decision is in the hands of the prime minister. There will not be a decision if the prime minister does not make it. He now has made a decision – various excuses are his decision," said Ariel. MK Shlomo Molla (Kadima) claimed that the red tape preventing the Falashmura immigration is rooted in the government's targeted, racist policy: "We will not bring black Jews from Ethiopia – this is the guideline. Bring us this list because you are lying. If the state comptroller asks for the list, why aren't you bring it to us? How many people's tears must be shed until a decision is made?" Molla also criticized the government's decision to only allow 3,000 Falashmura to immigrate, when in reality there are three times as many remaining in Ethiopia. In a joint discussion with State Comptroller Micha Lindenstrauss, who noted that the government is relying on figures put forth in his report that there are 3,000 Falashmuras, Molla suggested that the government instead rely on Interior Ministry numbers, which cite some 8,700 Falashmura. At least one problem was solved during the discussion when the interior minister heard the story of an IDF soldier whose grandmother and two brothers are still in Gondar. The soldier, whose name is Asachana, read a letter that he sent the interior minister. "I immigrated in 2003. Four years later, another two of my brothers immigrated. Two more brothers are in Gondar. We, my family and I, dreamed if being in Israel. My dream came true and I immigrated. I invested my time in studying Torah, tradition, and culture. My older brothers and grandmother were told they would immigrate later… I defend the borders of the country, which is not letting my family unite. You are doing a terrible injustice to my family," read Asachana. In response, Yishai said, "This is an example of how deep the bureaucracy is. It is heart-wrenching. This is precisely the reason I am fighting to bring everyone here." Afterwards, Yishai turned to Asachana and said, "I ordered an exceptional examination to be performed so that they will immigrate to Israel in the next aliyah." See all talkbacks "MKs slam PM over treatment of Falashmura"